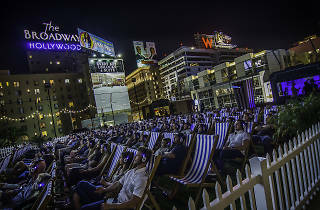 The masters of al fresco rooftop movie viewing are returning for their third season of screenings, and have expanded to two locations: their original spot on the rooftop of the Montalbán in Hollywood, as well as the roof deck of LEVEL in Downtown. 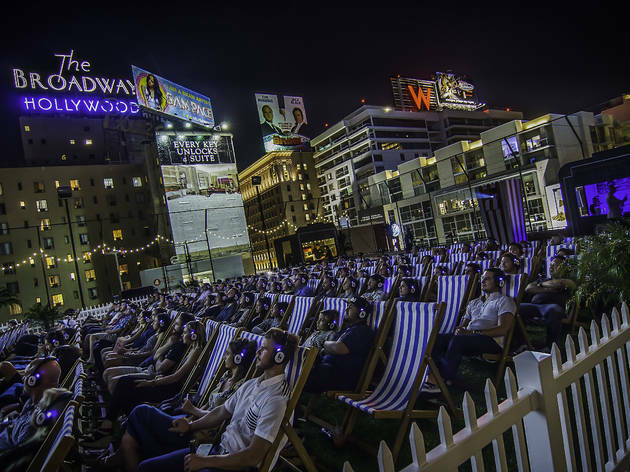 Known for excellent film choices and a steady supply of snacks and booze, Rooftop Cinema Club is your snazzy, comfortable and less stressful alternative to other outdoor movie screenings. Taking full advantage of the Montalbán and LEVEL's rooftops; RCC promises to offer some of the most unique and incredible movie-going opportunities for film lovers throughout 2017, plus some pretty great rooftop views. You don't even need to bring your own blanket or camping chair—Rooftop Cinema Club provides you with your very own comfy lawn chair, as well as blankets on request for the ultimate cozy experience. And instead of listening to the movie over loudspeakers, you'll get a set of wireless headphones so you never have to miss a word. The series is packed with a wide selection of audience favorites, kicking things off in April with Blade Runner on opening night, and hitting up everything from recent favorites like Moonlight to classics like Back to the Future and Sunset Boulevard in the weeks and months that follow. General admission tickets are on sale now. Click the film title below to purchase general admission tickets for $19 or the brand-new Rooftop Loveseats for $29. Doors open at 6pm each night and screenings begin at sunset. See you on the rooftops!